Inside La Quena in its heyday. Book and photos for sale, author signing. Kerry Coast has launched her publishing labour of love electromagneticprint.com with a collection of photos and short essays by longtime community activist Alan Fossen. I remember Al around The (Commercial) Drive a lot in the 80s and 90s – at marches, rallies, festivals, May Day and on the street, but mainly at La Quena. 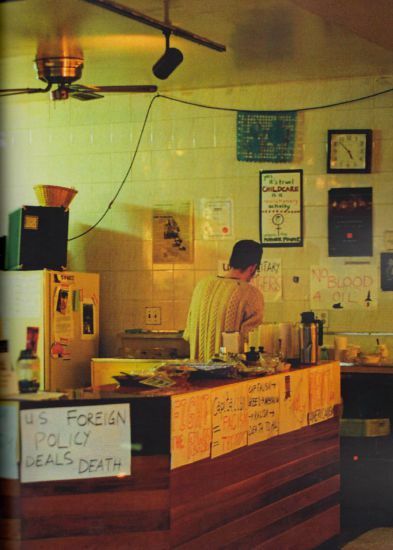 The Latin American co-op coffee house was a community beacon at a time when most activists were pretty hunkered down. There were still a few Marxist study groups and the annual Grovel for Peace March, but it seemed like much of the activist focus was on Latin American communities in exile. The Sixties were long over, it was Mulroney , Reagan, Thatcher and the full-on US wars in Latin America. Political refugees flocked here – from Chile, Guatemala, Colombia, El Salvador. Many found some degree of relative safety, although the immigration process was brutal. You can feel the mood in Al’s photos of graffiti from the time - Humans in captivity, 125 years of theft, Draw all you want – ya still get burnt, Capitalism is extinction – subvert or die. Wherever people came from they brought their politics with them, and that’s where much of the colour seemed to come from as well. The photos are haunting - sparsely populated, determined. There’s a great photo of an outdoor concert at the end of Kerry Coast’s introduction featuring a backdrop of banners from many of the active organizations of the time – Kinesis, Tools for Peace, Ecos De Mi Pueblo. Many of the posters through the book are centred on struggles to the South. Al’s short essays on topics including fascism, criminalization of the poor, the politics of food and racism might seem strident. They were written in the left language of the time – capitalism, imperialism, class. The selection gives the reader a peek into that time when there were a lot of bars and shadows on activism in Vancouver. The most fascinating thread for me was the unfolding story of La Quena's pivotal role in the activist community and its ultimate demise at the hands of Revenue Canada.